Albert worm gear screw jacks. ALBERT precision screw jacks are now available in Australia. Manufactured in Austria, Albert offers a standard range of screw jacks, along with custom designs to suit particular applications. Worm gear screw jacks offer ease of use, high dependability and low maintenance costs. They can be used to lift, lower, pull, move or align any load, even if unbalanced, with a high degree of synchronisation. · Maximum stroke of 10m. · Static load capacity up to 1000kN over 10 sizes. · Load supported without an external brake. · Maximum lift velocity of 0.5m/s. · Available in 'fast' and 'slow' gear ratios. · Load locking nut available. · High precision and low backlash available on request. · Spindle thread protection available. · Can be floor, ceiling or wall mounted. · Can operate through all angles between horizontal and vertical either 'up' or 'down'. Albert screw jacks are available with a variety of spindle ends, including threaded, plain, flanged and clevis, for load fixing. Special designs are also possible. A variety of mountings is available and these can be used with the range of spindle ends in any combination. 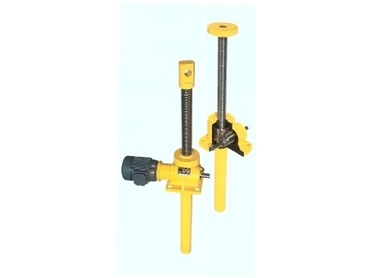 Screw jacks can be used singly, or in multiples with suitable connections. They can be manually operated, directly driven by electric, hydraulic or pneumatic motors, or other forms of drive. Imtec 03 9587 9033.